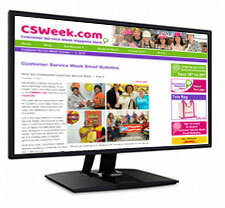 Sign up today to receive Customer Service Week Email Bulletins. Timely Reminders. Keep on top of the planning process and never miss a deadline. Events & Activities. Hundreds of service professionals share their Customer Service Week agendas with us. We pass on the very best ideas to you. Special Discounts. As a member of the Customer Service Week community, youll receive special offers and discounts on celebration materials.